The forts of Maharashtra unfold before us the history, architectural style and cultural heritage. Standing as silent sentinels in history are the 340 odd forts. Smacked by the ocean waves, singed by the blazing sun, or lashed by tempestuous Deccan rains, stand imposing ramparts and crumbling walls – the memories of Maharashtra’s martial times. Nowhere in the world would you encounter such a profusion of forts and such variety in their architecture. Located on an island, as at Murud-Janjira or Suvarnadurg or guarding the sea as at Vasai, or up amidst the Sahyadris as at Toma and Raigad, whose circuitous walls and spherical bastions sit like a scepter and crown amidst high hills. As you trek you may come across caves dating back to pre-Buddhist times at Shivneri in a prison cell at the warrior queen Chand Bibi’s immortalized Ahmednagar Fort, where Pandit Nehru wrote ‘Discovery of India’. Today the sentinels that stand quiet, singed by the sun and sleet, have not only been witness to changing times, but have also shaped them. That is where the heights of forts in Maharashtra lies, for example the fort at Shivneri. The triangular-shaped massif, overlooking the ancient trade route from Sopara to Paithan, was inhabited by Buddhist monks, who provided shelter to missionary monks travelling down the route. The early Hindu Kings, fortified the hill to ensure smooth traffic, to use it watch-post of wares and to protect the religion centered. Chand Bibi, the warrior queen of Ahmednagar sought shelter here from the raiding armies of Akbar. Shivaji who fought for ‘Swarajya’, was born here, his mother Jijabai being sent here by her husband, as Shivneri would provide a safe refuge. There are other forts which have always maintained their character as ‘Durgas’ derived from the Sanskrit word, meaning, inaccessible. Most of the forts in Maharashtra whether upon Sahyadris or near the sea, are associated with Shivaji, not only a great warrior but also a great fort-builder. Shivaji embarked upon his career at uniting the locals against the Muslims suzerains by taking a fort ‘Torna’ when the commander was away to escape the ferocious monsoon. 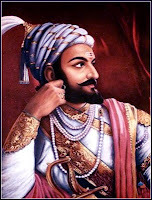 He strengthens his conquest by setting up capital on the neighboring massif, Rajgad and soon embarked on a fort capturing and fort building spree. The fort Pratapgad, immortalized by the ‘Waghnakh’ [Tiger Nails] tryst with Afzalkhan and Raigad, where he was Coronated are just two of the mighty hill forts Shivaji built. More than that, it was Shivaji who consciously taught the people to look upon forts with reverence and affection , and associate with them as one would with a mother. In times of peace, forts provided the populace with an income, as they supplied the ‘Mother’ with food and fuel. Forts in Maharashtra were once mini cities. The fort Panhala, where you can yet view three large buildings called the Amberkhana – a granary with the capacity to store 50,000 mounds of corn – is now a hill station, Raigad, the capital which Shivaji built on a hill, has a mile-long market place and ruined store houses which once accommodated a garrison of over 2000 men. The fort Purandhar, which once served as a capital of the nascent Maratha Kingdom, now houses the National Cadet Corps (NCC) Academy. The construction of Sindhudurg, a sea fort along the Malvan coast is credited to Shivaji. He built and strengthened fortification on the coast with a view to protecting the outer flank of the state from the invasions from the sea. As many as 13 forts were developed by Shivaji on the coastline, including Vijaydurg, rated as the perfect example of a great coastal fort. Most of the forts in Maharashtra are in a state of ruin, with ancient walls, since long razed to the ground and practically denuded of early monuments, just wounds of desolate ruins. Even if the exact nature and character of the buried monuments is not known, the Ruins occasionally are so imposing that they give an unmistakable notion of the grandeur and the majesty, these places once must have owned. For Example, the fort doors have obviously suffered the maximum damage from all possible causes, such as destruction, re-Fortification, seizes, weathering, neglect etc. Despite, though snatched off their decorations of gold, silver and precious stones, a few of them even today retains ample evidence of their past glory. The Ruins do not merely reverberate with the memories of the past, the decayed fortifications also enhance the picturesqueness, of the rugged hills. In most of the fortification, various architectural styles : Hindu, Muslim, Portuguese, Maratha with all their shades have amalgamated or at-least co-exist, with every monument, showing the impact of its time. For instance even today, the fort Shivneri shows the traces of as many as seven proprietors, the ancient Buddhist monks, the early Hindu Kings, the medieval Muslims, the tribal Mahadeo Kolis, the 17th - 18th century Marathas, the British and finally of course the modern Indians, thus encompassing a mini-sketch of the history of the Deccan.